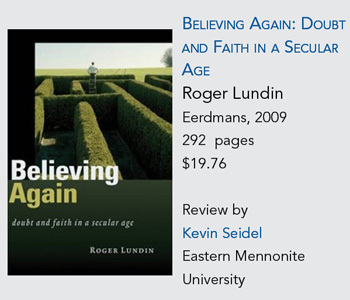 The title of Roger Lundin’s book Believing Again comes from the eighteenth-century German aphorist G. C. Lichtenburg, who said “There is a great difference between believing still and believing again.” Lundin picked up the aphorism from the poet W. H. Auden, who used it on several occasions in his Forewords and Afterwords to indicate the difference between a naïve and tested belief (55, 87, 518). Those who believe still what the church has always believed, what their parents believed, what they themselves believed as children, says Lundin following Auden, do not believe like those who struggle to come to terms with unbelief and find themselves believing again. The essays that comprise Lundin’s book are simply titled and arranged into three sections. The first section includes two essays (“History” and “Science”), which show the contours of the nineteenth-century’s crisis of faith. The second section of essays (“Belief,” “Interpretation,” and “Reading”) examine different facets of that crisis. 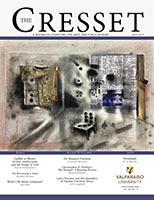 The essays in the third section (“Story” and “Beauty”) describe two creative responses to that crisis. In a final chapter called “Memory,” Lundin tries to articulate an approach to the past that is Christian rather than nostalgic. He quotes extensively throughout his essays from Emily Dickinson, Herman Melville, W. H. Auden, Fyodor Dostoevsky, and Czeslaw Milosz, exemplars of the “nimble believing” (a phrase from one of Dickinson’s letters) that Lundin considers a crucial stage in the journey to believing again. To be clear, Lundin is not primarily interested in unbelief, not in refuting it or fixing it. What Lundin hammers against in his essays are forms of believing still, that is, forms of Christian belief too nostalgically attached to certain moments in the past, to the supposedly unified Christian culture of the Middle Ages, for example, or to the exalted view of the individual inspired by the romantic period. It is easier to say what Lundin is against in these essays than what he is for, what he means exactly by believing again, because he nowhere risks a clear, overarching thesis, not for the collection as a whole, not in the individual essays. The essay titles might have offered some guidance, if Lundin had said that each one names a different obstacle or barrier to belief. For example, in the third section, what preoccupies Lundin is not “Story” per se but stories that have made the Christian story more difficult to believe. Similarly, in the next essay, he is less interested in beauty than in concepts of beauty that make it more difficult to appreciate the “beauty of belief” or “beauty as belief” (212). Each chapter, then, names one tall hedge, one wall of the maze depicted on the front cover of the book. Altogether, Lundin’s essays are intended to be the ladder that readers can climb to help see the way out, to see again the expansive field on the horizon, the great cash crop of Evangelicalism—vigorous, green individual belief. Yet to judge this book by more than its cover, here are a few points of criticism about the role of the literary arts in Lundin’s essays and about his depiction of what constitutes believing still. The internal sequence of Lundin’s essays discloses some of his assumptions about the role of literature. 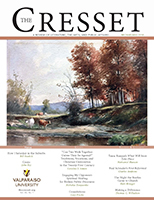 Take chapter two, “Science,” where Lundin uses Dickinson, Auden, and Milosz to describe the growing conflict between science and imaginative literature that emerged in the late nineteenth century. Each poet depicts a suffering humanity living in the flinty, indifferent world given to them by nineteenth-century science, and each poet turns, Lundin shows convincingly, to images of a “suffering Christ” for consolation, as the old arguments for design in creation break down. While Lundin clearly admires the way these poets invoke the suffering Christ, he criticizes them, along with much of twentieth-century theology, for not believing more, that is, for not affirming the resurrected Jesus. Whereas the poets are reticent to speak of the resurrection, “the New Testament asserts that we are able to know everything we need to know” about the identity of Jesus (98). For Lundin, the poets articulate the problem that the New Testament answers. By chapter seven, a pattern has emerged: the intellectual problem named by the essay title is discussed at the beginning. Then the poets and novelists are brought in to show the subtlety of the problem and struggle with it bravely. Finally, the New Testament or the theologians (usually Karl Barth or Hans Urs von Balthasar) arrive to solve the problem. For Lundin, artists like Melville and Dickinson deserve praise because they don’t settle for unbelief, that is, they keep struggling to believe, hinting at the supernatural. Yet, for “a robust understanding” of what such hints point to, “the Christian student of nature and culture” must turn to scripture and to the theologians (133). Even where Lundin tries to qualify his usual submission of literature to theology, he still keeps the arts not yet believing, just outside the borders of belief. The poets “may not proclaim Christian truth as vigorously as the theologians,” Lundin acknowledges, but that “should not obscure... the importance of their restless, ceaseless, and nimble efforts to “believe again” (134). The word “efforts” is crucial here. Try as they might, the poets cannot quite believe. For Lundin, good poetry seems to teach a kind of condescension toward unbelief: if great artists like these refused to settle for unbelief, who are we to do otherwise? 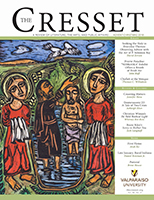 Some Christian scholars may appreciate this approach to literature, its careful preserving of the Bible as the last word or the theologians as the final authority, but other scholars may feel more heavily the weight of condescension, that something has been lost in using literature this way, as round artistic holes for square theological pegs. Another problem is Lundin’s depiction of what constitutes believing still. For example, he is right to try to historicize romanticism, as he does in chapter one, to loosen the “ties between Protestant spirituality and romantic aesthetics” (37), but he relies too heavily on old ideas about the period. He would have a harder time criticizing the romantics if he had supplemented what he learned from M. H. Abrams with more recent accounts of the period, such as Lori Branch’s chapter on Wordsworth in her recent book Rituals of Spontaneity (Baylor 2006). Furthermore, he rides out a number of times in his essays against what he calls “spatial models” of truth, that is, notions of ourselves or of God that rely too much on the language of up and down, inside and outside. Lundin recommends that we abandon spatial metaphors and adopt “narrative” models of understanding instead. Elsewhere, he tilts against what he calls the “occularcentric” understanding of the self (193), a way of thinking dominated by visual metaphors that Lundin says rose to power on practices of silent reading (186). With his usual flair for generalization, he says that “the invention of the printing press silenced the cosmos and paved the way for the rule of sight” (201). It is difficult to imagine how we as human beings could escape this rule of sight altogether, since we have eyes. And why should concepts of “narrative” or “orality” give us access to the truth less prone to error or misuse than concepts of “space” and “vision”? Yet, Lundin’s idea seems to be that if we could change our spatial models of truth for narrative ones, trade our visual metaphors of understanding for aural ones, then we would more closely approximate “the priorities of the biblical writers” (198), and so find ourselves believing again, more robustly, more resiliently. Like most intellectual hobbyhorses, these two are generally harmless, but there is one moment in the essay where they pull Lundin into terrible understatement, when he tries to recruit Dietrich Bonhoeffer for his attack against believing still. Lundin says, “Bonhoeffer’s reflections on religionless Christianity and the suffering of God were efforts to meet the challenges posed by spatial models of the cosmos and visual conceptions of knowledge” (204). So what makes it difficult to believe in a loving God who is at work in the world today? Apparently, it is not the atrocities of war, the pervasiveness of human suffering, or the worldliness of the church, not the rise of historical criticism or evolutionary science, not these so much as quarrels over interpretation and practices of silent reading. Yet, Bonhoeffer’s reflections on religionless Christianity, in his Letters and Papers from Prison, are about much more, if one goes back to look. Whereas Lundin wants to hold on to the possibility of believing again by reviving a more humble author, a more moderated view of language, a shift to aural metaphors of understanding, Bonhoeffer seems to be trying to find a way beyond the struggle between belief and unbelief altogether, that is, a way for Christians to stop putting all their efforts into maintaining their own belief, in however subtle a form, and, more importantly, to stop clinging to a God of the humanistic gaps, a God who only appears, Bonhoeffer says, “for the apparent solution of insoluble problems, or as strength in human failure—always, that is to say, exploiting human weakness or human boundaries” (154). This is the passage from Bonhoeffer that one wishes Lundin had spent more time with than he does (206–207), especially toward the end of his book. In the last essay, “Memory,” Lundin discloses what he considers to be the crucial legacy of the nineteenth century, not its skeptical historicism or proud science but its preoccupation with orphans, which illustrates to Lundin that the era’s “delight in having been liberated was slowly changing into the fear of being abandoned” (274). Lundin is there to speak tenderly to that fear, of course, to hint that Christians need not be so afraid, if they believe in God. What then moves us to believe again? Refusing nostalgia, Lundin settles for a kind of pathology of the Victorian period that he calls his intellectual home (3). Thus, despite his admirable taste in authors, his well selected quotations, his ability to lean on the work of other scholars, his forthrightness in speaking of his own faith, and his candid reliance on theologians and the New Testament, Believing Again too often keeps God at the limits of human ability, not transcendent so much as tethered to our weaknesses, to what literature cannot quite achieve, and, ultimately, for Lundin, to the fear that our secular age has been abandoned by God. Kevin Seidel is Assistant Professor of English at Eastern Mennonite University.